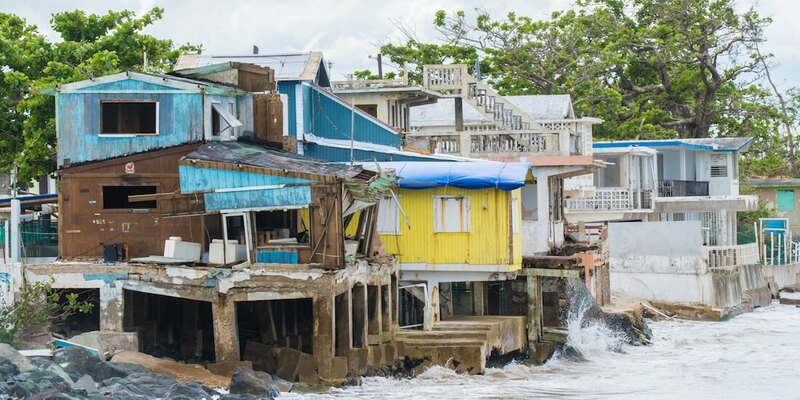 In October 2017, Hurricane Maria devastated buildings and the power grid in Puerto Rico. Days before an island-wide blackout in April 2018, almost everyone in Puerto Rico had power restored following Hurricane Maria—just 3 percent of customers were without power, according to a statement by the Puerto Rico Electric Power Authority, as reported in the New York Times. But shortly after the announcement, an accident involving the high-voltage line of a fallen transmission tower darkened the country yet again, cutting power to nearly every home and business. 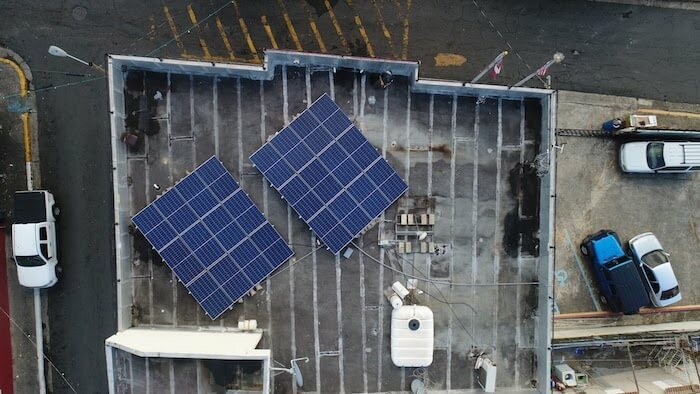 Back in October, shortly after Hurricane Maria battered Puerto Rico’s shoreline, Birt partnered with the Bay Area–based nonprofit Empowered by Light and Sunrun, the largest home solar company in the United States, to coordinate the installation of rooftop microgrids at two San Juan stations and one in Nagüabo. He also worked with Zero Mass Water to install solar-powered clean-water machines at a fire station in Utuado. The 6.6-kilowatt, 24-panel solar arrays, designed with Autodesk AutoCAD and installed in less than two days, are connected to a lead-acid battery system and capable of charging themselves, off the utility grid. They are critical, Birt says, to the life-saving operations of a fire station: powering dispatch towers, charging radios, opening bay doors, and keeping the lights on. After an island-wide blackout in April, solar microgrids at fire stations provided essential backup power for first responders. Courtesy Sunrun/GivePower. Andy Newbold, senior manager of public affairs at Sunrun, says the company coordinated the transportation of 15,000 pounds of solar equipment to Puerto Rico for the first trip. This involved warehousing the equipment in Miami before loading it on a Lockheed C-130 Hercules military transport aircraft. The cargo included solar panels and battery storage units, solar-powered machines donated by Zero Mass Water that create drinking water from vapor, and solar-powered desalination units supplied by GivePower. Sunrun plans to power five more fire stations and provide additional solar equipment for food markets and medical centers. For Birt, reports that firefighters in Puerto Rico weren’t receiving 911 calls in the aftermath of Hurricane Maria were a call to action. He had just lived through the October 1, 2017, mass shooting at the Harvest music festival in Las Vegas, where he had been on duty, listening to distress tapes and coordinating response teams. 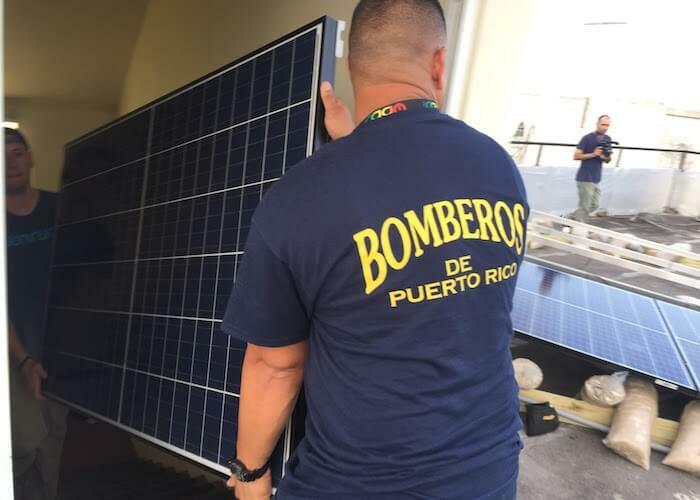 Birt then began connecting the dots between self-sustaining solar microgrids and communication for first responders in Puerto Rico’s crisis. “Getting people to the right places—the difference between dying and not dying—was communication,” he says. After massive power outages, Puerto Rico’s powered fire stations became de facto community centers. Courtesy Sunrun. Eventually, Cruz gave Birt the green light to introduce microgrids at three fire stations, beginning with one in Barrio Obrero, one of San Juan’s poorest neighborhoods. Birt plans to continue raising funds to power all 96 stations in San Juan. Get the software that’s helping Sunrun turn Puerto Rico’s lights back on. Newbold assisted with the installation in San Juan. He recalls a ravaged city and countryside as dramatic as the news images: relief and FEMA workers sleeping eight to a room in hotels powered by diesel generators, uprooted trees and fallen power lines spanning roadways, transmission wires balled like yarn. 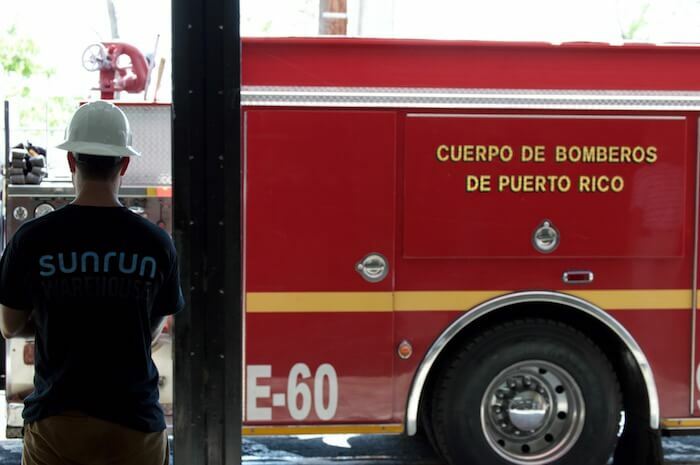 Funds are being raised to install microgrids at all 96 San Juan fire stations. Courtesy Sunrun. Birt has lived in a solar community in northwest Las Vegas for more than 15 years on a self-made home solar system connected “to a nickel-iron battery designed by Thomas Edison for a car show.” In his view, connecting independently operating hives of self-charging solar panels and battery storage units in Puerto Rico is vital to enable 911 dispatch backup for first responders, to strengthen resiliency, and to support public health and safety in homes and businesses.